The snow is pouring down. The sky is grey and our batteries are low. We’re staring into the face of a colder cold snap than we’ve seen in these parts for quite awhile. But the fire is bright and our hearts are warm. 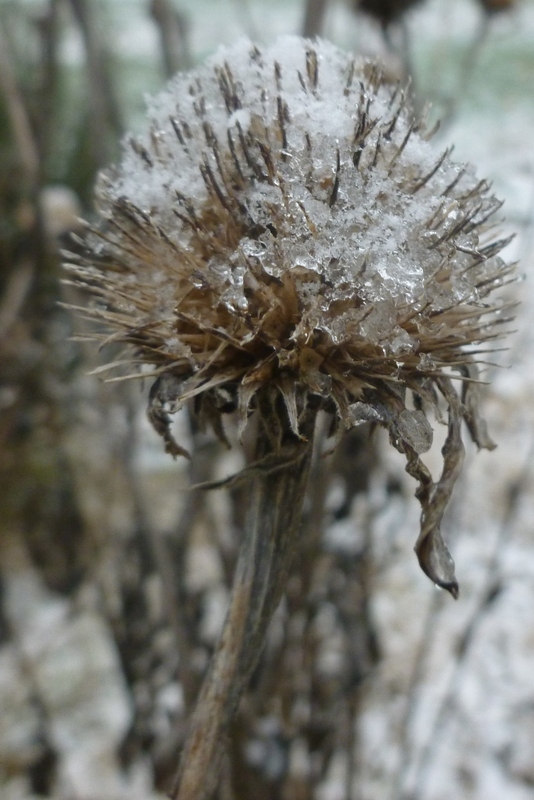 On New Year’s Day the sun was shining and the day was just a beautiful sort of chilly. We buckled up and made the hour long drive up to Hill and Hollow Farm for one of the best gatherings of the year, in our opinion. All this talk about traditions and celebrations made new and personal holds true for this one. 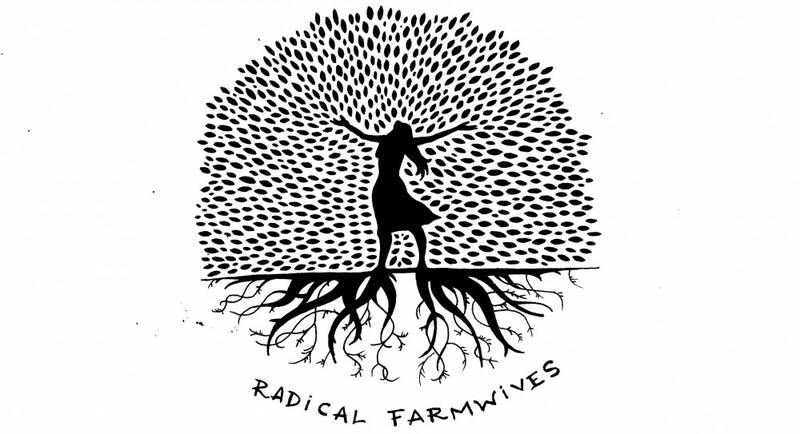 Our fellow farm family at Hill and Hollow hit the nail on the head when they started this one. We have small children, and a lifestyle that does not lend itself to late night parties. It’s been more than ten years since I went to a New Year’s Eve party, and stayed. But a reasonable daytime gathering of like-minded friends, full of great food and kids playing all over the place, is right up our alley. The children start to talk about it before Christmas. It’s a highlight of the year. And now, it is a birthday party, of sorts. It was at last year’s New Year get together that Robin brought up the idea of this combined blog-effort. As I remember it, we were all in the kitchen. Cher was probably whipping cream or beating eggs for eggnog. Robin said something along the lines of “I’ve been looking around at this blog thing. We’ve GOT to do this.” We all gestated it for a month, got together for Madeline’s birthday party, and decided to make a go of it. Here we are, a year later, still going. I have to hand it to Robin – she has excellent ideas, good follow through, and a will to really bring people together. What an awesome combination. We’re all busy people. Our days are overflowing, but this new touch-stone brings us into a wonderful place of mutual appreciation. There’s the real deal – we’re in it with each other. And now, dear readers, we’re in it with YOU, too. 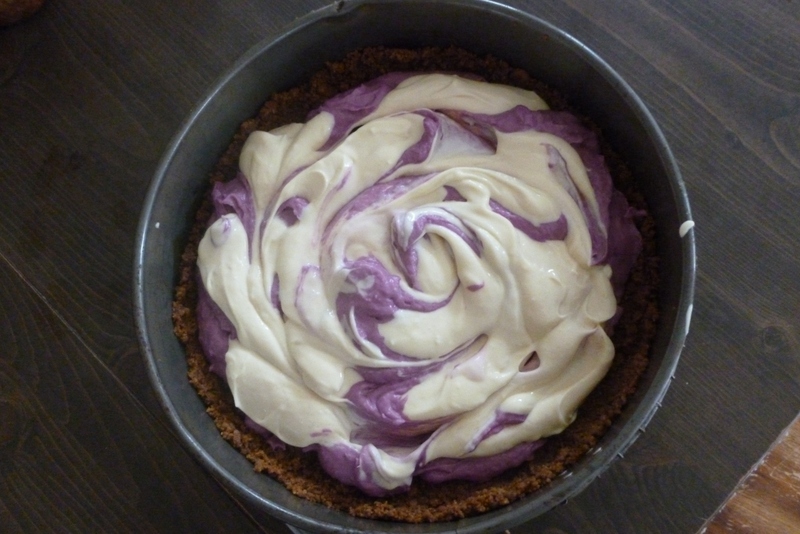 The purple sweet potato cheesecake took the place of my usual confectionery contribution to the party – baklava. For a cheesecake recipe I like – visit this web page. So, between glasses of eggnog and various delicacies of our various farms and gardens, we chatted about our efforts a little. Not too much. The kids were busy making noise, and there were other friends to visit besides the three of us. Mostly, we enjoyed the fact that we’ve come this far. We hope you’re enjoying this vicarious ride through the seasons of our families, farms, lives, as much as we’re enjoying sharing it. 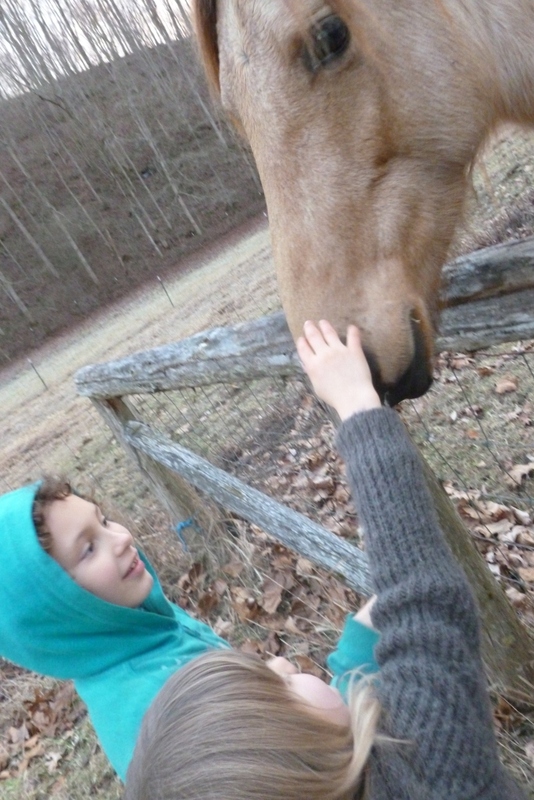 The day was capped off with a visit to Sasha’s horses, which was a major wish fulfillment for Lulah and Opal. 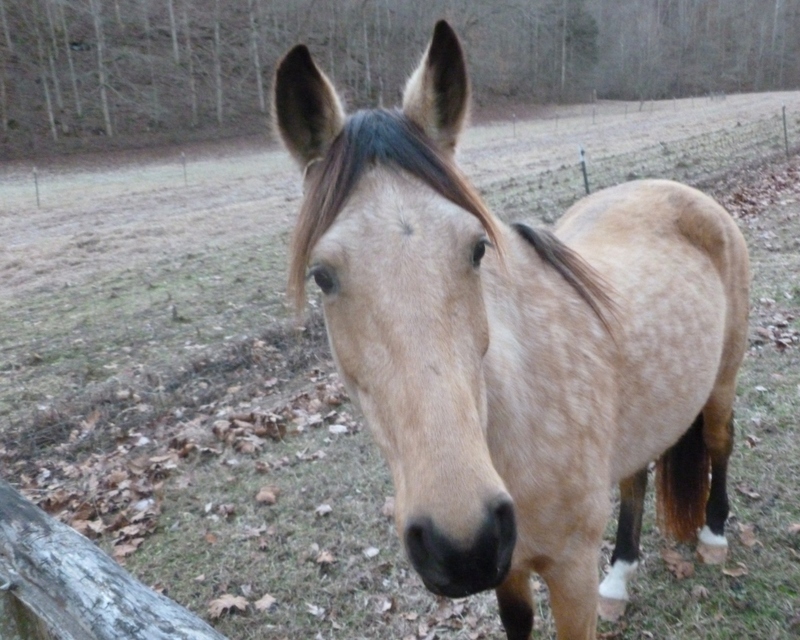 The radical farm-girls ran back and forth all around the edges of the horse pasture, finding any little patch of green grass to pluck for Rosie, the friendly one who trotted right over when she saw us coming. Sasha came by with Madeline and Ira as darkness was falling, and Robin and I watched the kids feed the horses as twilight turned to dark. If the first day of the year reflects how I feel about the year to come, then this was the way to spend it. In fellowship with friends and family, reflecting on our paths, celebrating and sharing what we’ve experienced, leaving for home with sleepy happy children tucked in the back, brimming with good will and love for one another. This entry was posted in coree's posts and tagged celebration, children, family, food, new year, winter by Coree. Bookmark the permalink. Beautiful sunset picture! Congratulations on one year of a combined blog and you all are still friends! Sounds like you have such a lovely network of friends. What an awesome idea for a cheesecake – its fantastic that the color is all natural! 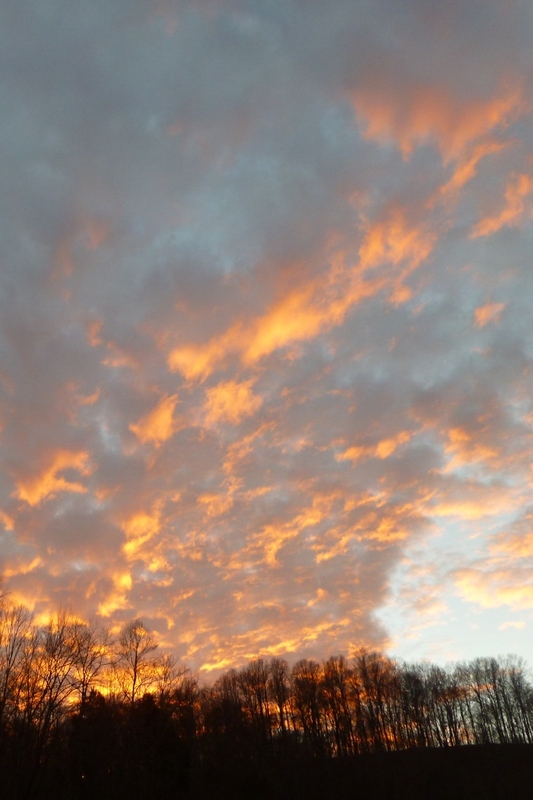 it was a beautiful sunset – i was grateful to be able to catch it that well. i can’t say enough about the purple sweet potatoes. they’re just the funnest food we’ve grown in awhile. thanks for reading! That final photo is breathtaking. The sky looks like it is on fire.